Left click on the pump model to open its settings. Pump types are selected from the drop-down list. Port size, in mm, is included in the system pressure losses. 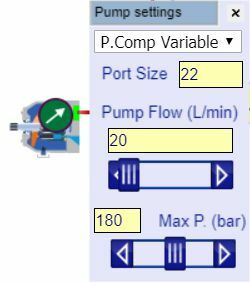 Pump flow sets the maximum L/min. Variable pumps will drop below this once the set pressure has been reached. Max. P. is the compensator set pressure for a variable displacement pump. Pump flow will always be constant for a fixed displacement pump. Max. P. is the highest pressure the pump should ever see although it only explodes when a slightly higher value has been exceeded.